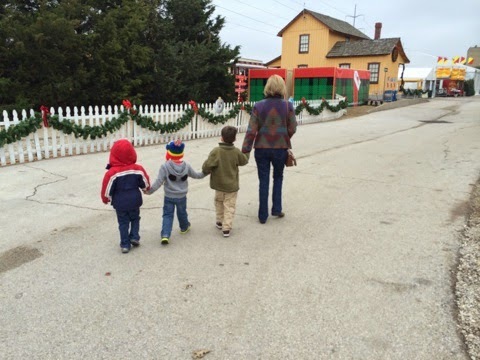 Two of the grands, my great nephew, and my niece went with me to ride the Polar Express. This is the wonderful picture my niece made as we made our way to the train. "Follow me, Boys"---I laughed and said I am applying for the job of the Pied Piper. Fun--fun--but safety comes by staying together--You need to keep your eyes on the leader. At some point during the day, the troops got out of control and failed to follow the leader. This always leads to trouble--someone may get hurt, there are dangers lurking, and you may loose your way. I grabbed one of the boys during the afternoon and said, "You will not run away--you need to stay close and obey." Someone has to be "The Leader" and that someone needs to be trustworthy and have your best interest at heart. A Good Leader is always concerned for the well being and protection of those who are following. It also pays to choose a good leader to follow. There are more Indians than Chiefs--and ALL of us are Indians at some point in time. If you are going to follow---pick someone worthy of being followed. LONG AGO--there were two who stepped forward and said, "Follow me and let us go see this sight." Someone stepped up and gave the command or asked the question of gave a suggestion that they should go and see this baby they had heard so much about. One Wise Man and One Shepherd made the bold proclamation--we need to go see. If the other Wise Men and the other shepherds had not heeded the call to follow that day--they would have missed seeing The Wonder of the birth of The Messiah. A handful of people saw that glorious sight--knowing what they were seeing--but they would have missed the blessing had they not been willing to follow or had been distracted by the world around them. All these years later, we are still being called to "Follow Me". We allow ourselves to become disobedient--we take our eyes off our leader--and then realize the danger we have exposed ourselves to when we did not follow-sometimes too late. Seek His path--ask for His guidance--follow His wise counsel and be Blessed! AWESOME, AWESOME, AWESOME!!! Merry Christmas.